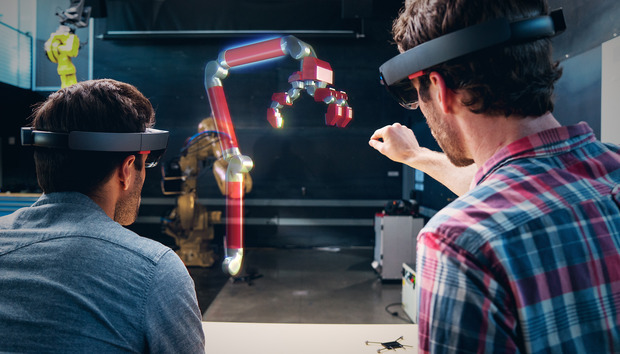 Microsoft has opened up sales of the HoloLens development kit to anyone with $3,000 to spare, a move that could significantly expand the community of developers building apps for the augmented reality headset. Until now, HoloLens was available only to developers and companies through Microsoft sales reps, but from Tuesday, anyone in the U.S. or Canada can buy up to five headsets online through the Microsoft Store. There was no word about availability in other countries. HoloLens can overlay three-dimensional images onto the real world. By tracking the user's movements, the 3D images can be continually redrawn to match the user's perspective, making them appear like objects in real space. One such application was demonstrated at last month's Worldwide Developer Conference in Toronto. Japan Airlines showed a HoloLens app that lets engineers get up close with a full scale, computerized model of a jet engine. The app can highlight engine parts and show how different components work together in a way not possible with a real engine. The HoloLens now on sale is the same developer edition that has been offered to Microsoft partners, and buyers are asked to acknowledge before completing purchase that they understand it's not a finished product intended for consumers. Microsoft also asks buyers to agree not to resell the product and acknowledge that no refunds are available. Difficulty in obtaining the HoloLens has led to a healthy mark-up on the device on Ebay. On Tuesday afternoon, units were selling for up to $5,000. In June, Microsoft said it was opening up the HoloLens platform, allowing other device makers to build their own versions of the product.